I took these photos yesterday in the garden. 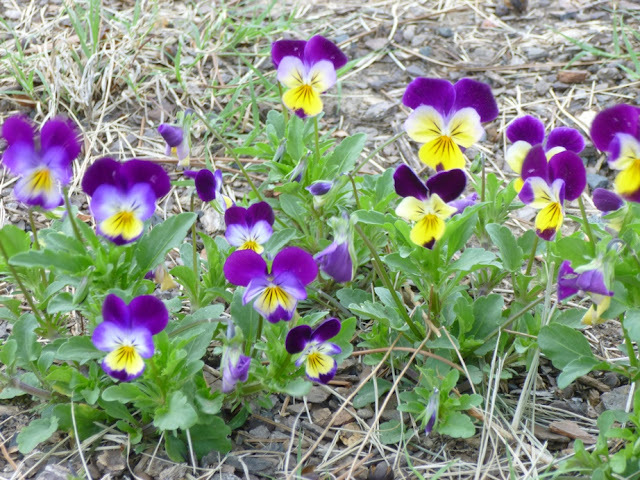 It is an exciting time with lots of flowers, new growth and bright prospects for the year ahead. To give you an idea of what these plants have had to deal with so far this year, temps have fluctuated all over the map. A couple of weeks ago, highs were in the 40s. Yesterday, the high almost hit 90. Strong winds (25-40 mph yesterday) have been the norm. We've had a decent amount of rain in the form of strong thunderstorms and downpours, including one last night. 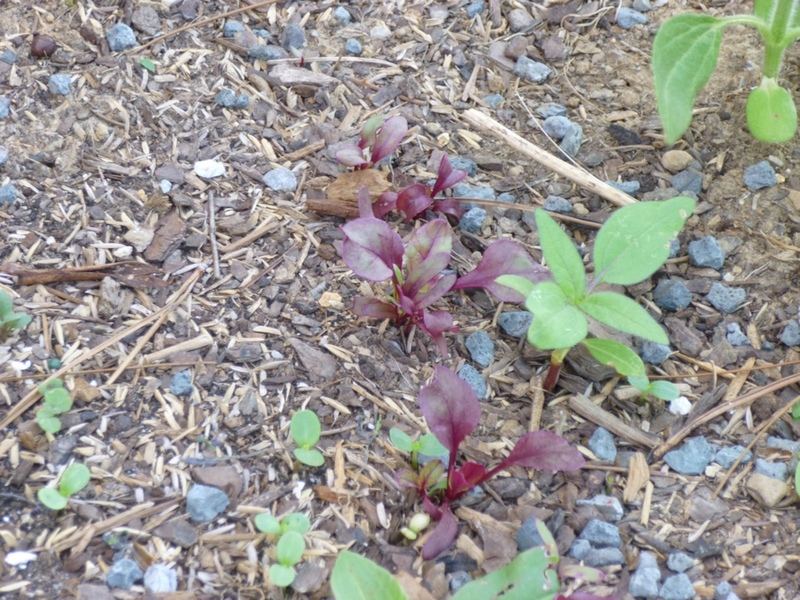 Generally speaking, the plants that I put in last autumn who had a chance to settle in over the winter seem much more confident and settled than the ones I just planted this spring, but many of the springtime transplants have done surprisingly well (much better than the previous two years). So either my technique is getting better, I bought healthier plants or I chose plants that are better suited for this environment and cited them better. I like to think it's a combination of all three factors! This is Sweet Woodruff. 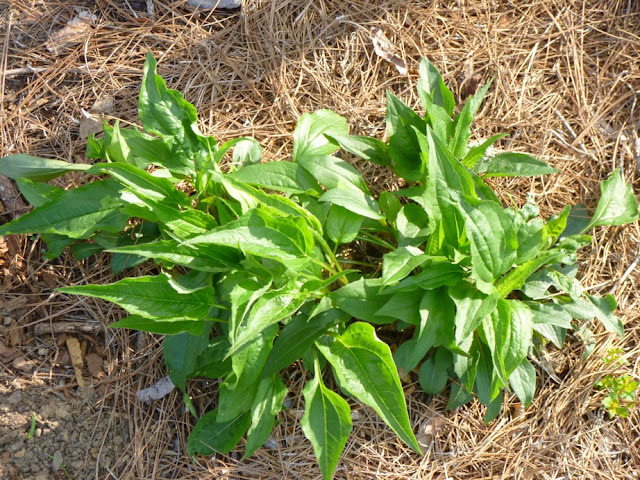 If you remember from a month ago (mid-March), the plant was much smaller and really tattered looking. I solicited input on whether to prune out the old foliage. Some gardeners did, others did not. I decided to see what happened if I let the old foliage alone. Just a month later, the new foliage has pretty much obscured any sign of the old foliage, which I imagine has decayed and thereby hopefully helped to give some nutrients to the plant. 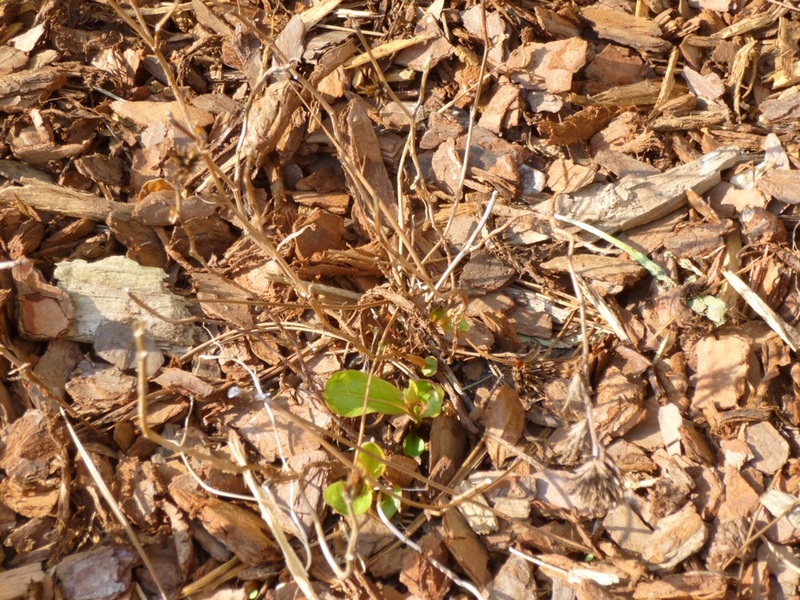 I'm happy to see how quickly the fresh foliage dominated without any intervention on my part, because it makes me think Sweet Woodruff could make a good evergreen large-scale groundcover as long as I don't mind 1-2 months of not-so-pretty old foliage (which I don't mind at all). Cycle of life and all that. 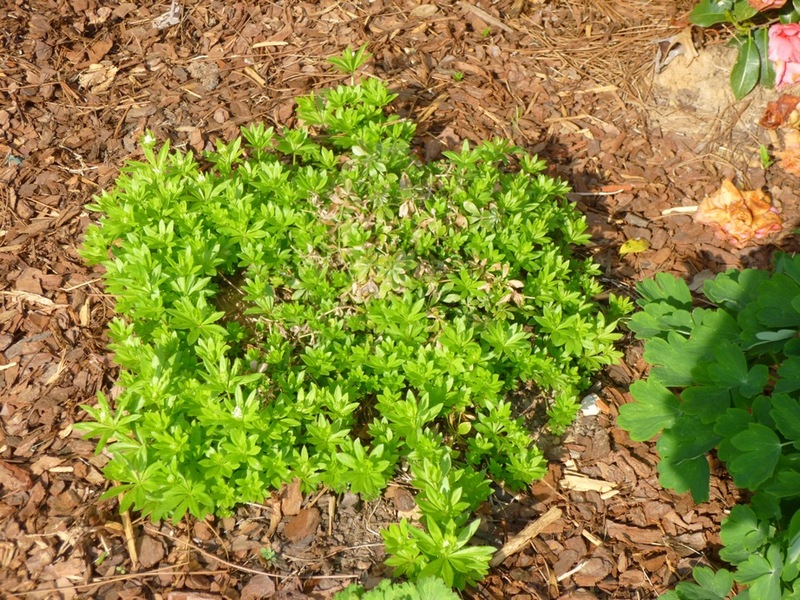 Sweet Woodruff also looks like it's getting ready to flower soon, which should be exciting. I've heard the flowers are fragrant and attract beneficial insects!! 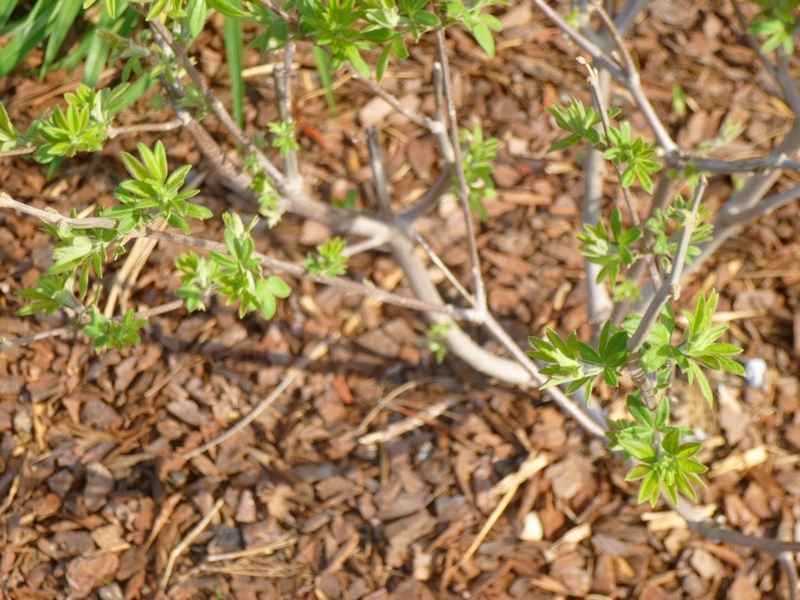 Beautiful new foliage emerging on the Vitex agnus-castus, situated in a windy full-sun spot. Some large shrubs that were here when we arrived. I'm not really sure what these are. Euonymous maybe? Although the color is a little garish, I have to say that these are real workhorses. I didn't water them much last summer in the awful 100+ heat and drought and they seem to have leafed out stronger than ever this year. They're semi-evergreen in Middle Tennesee. Their leaves turn purple, but they don't really drop their foliage into the new leaves are almost ready to appear. It's definitely the time for Ajuga to shine! 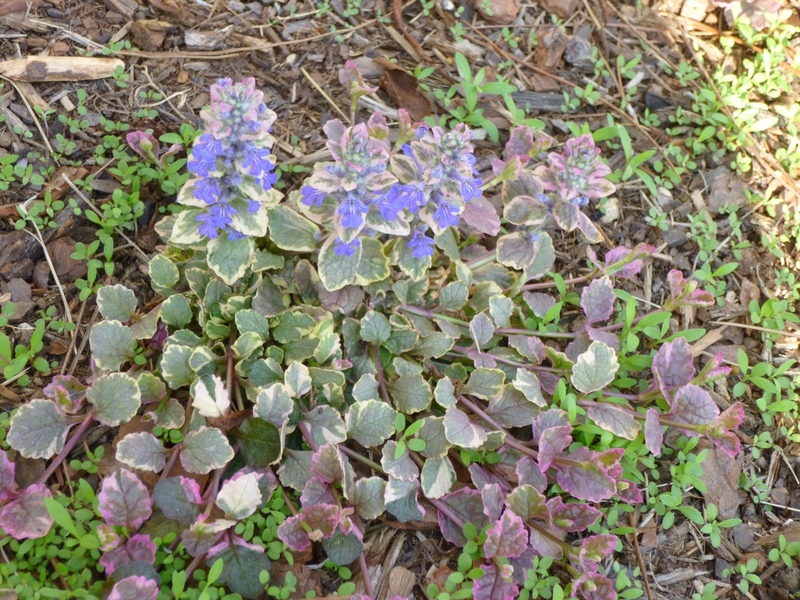 This variegated one is spreading amid a group of Sweet Alyssum seedlings. 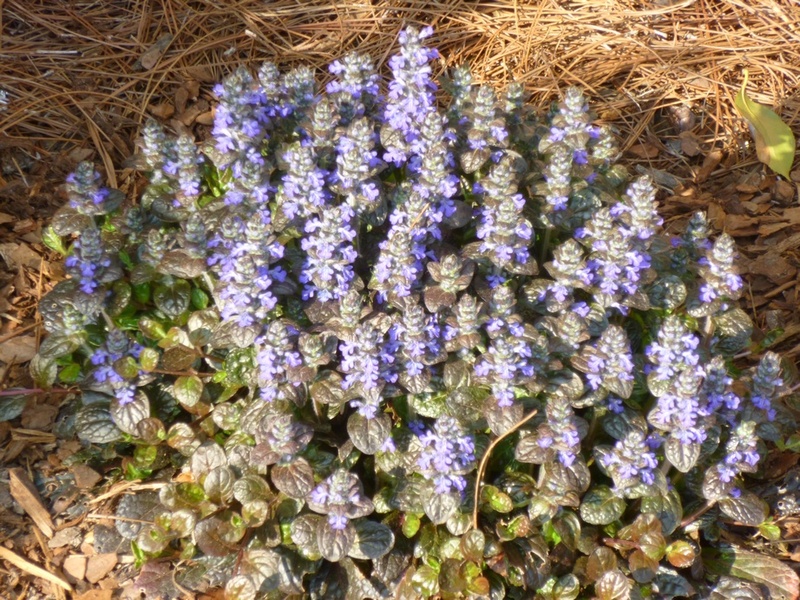 This is my first year seeing Ajuga send up flower stalks. I like the flowers, but have not noticed any bees or other beneficials visiting them. 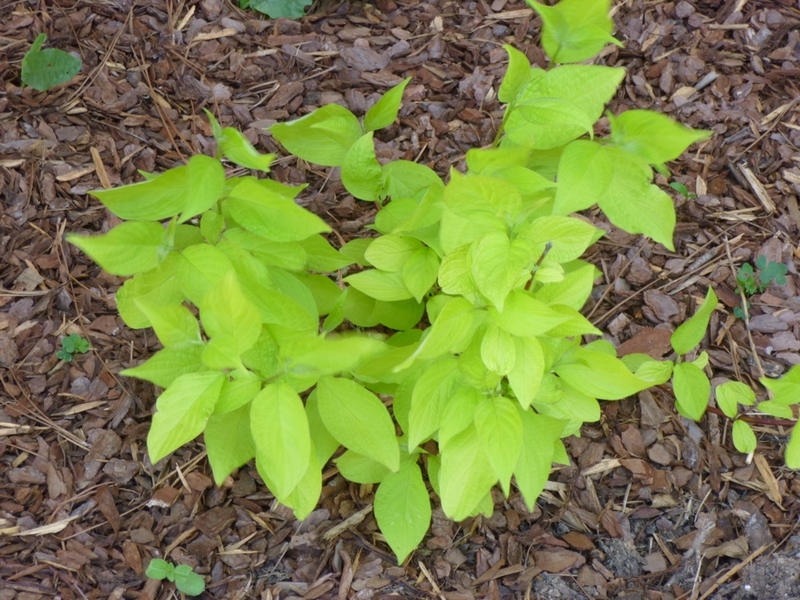 This is some sort of unidentified dogwood that I added last autumn. Really kicking myself for losing the tag. Anyway, I tried to site it in a spot where it's a little protected from the wind. Right now it gets morning shade and afternoon sun. 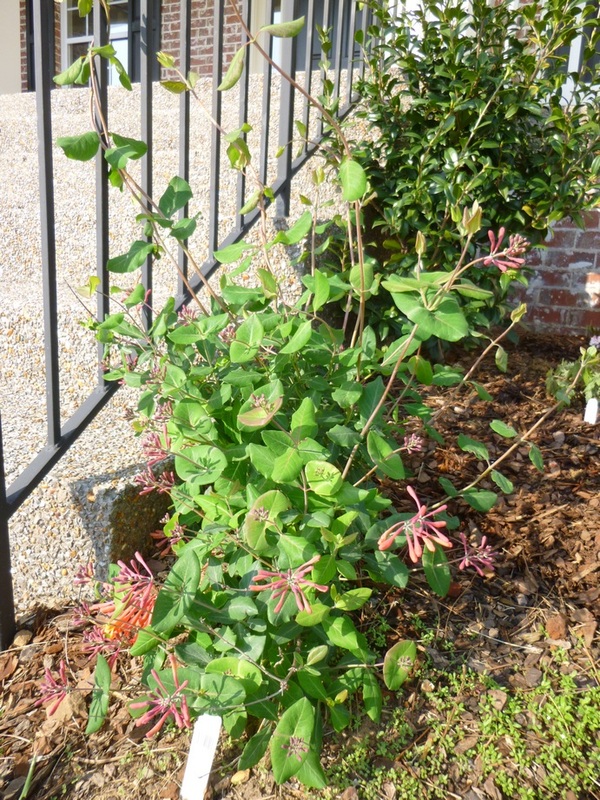 Will probably get more afternoon shade once a large Natchez crape myrtle nearby finishes leafing out. 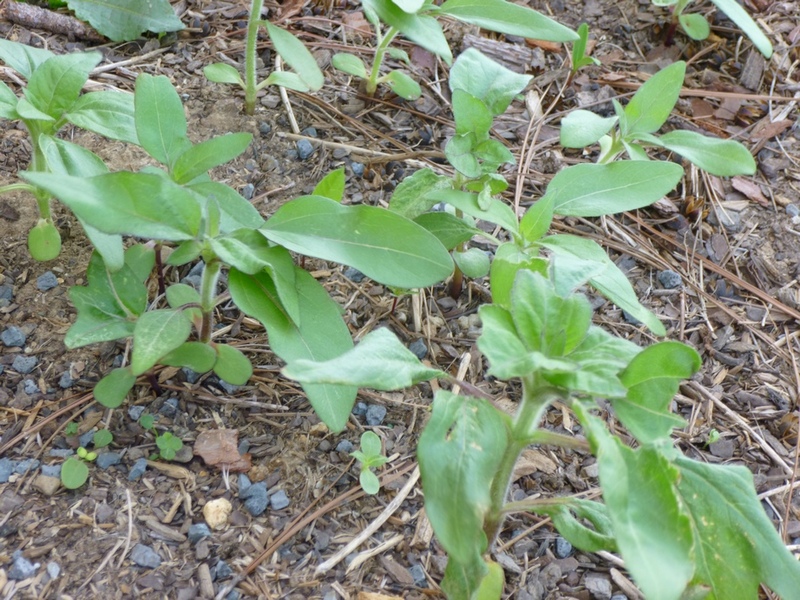 I've got a lot of these seedlings coming up in my landscape beds. At first I thought they might be some Tithonias that I planted last year, but which did not come up then. 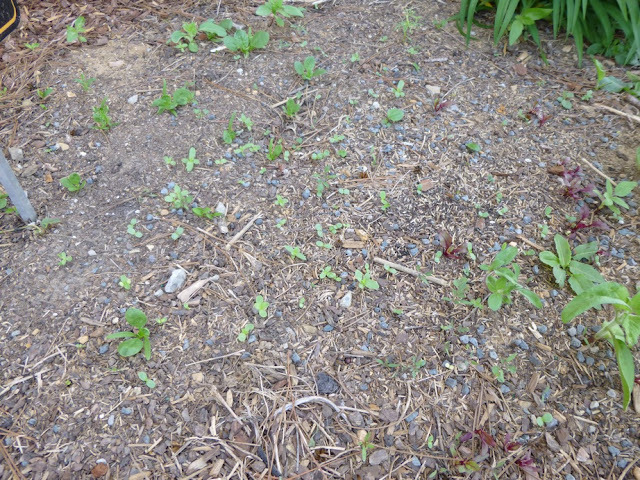 But I think there may be too many seedlings for that to be the case. Are they weeds? They don't look like weeds when they're small, but they look progressively weedier as the seedlings get bigger. 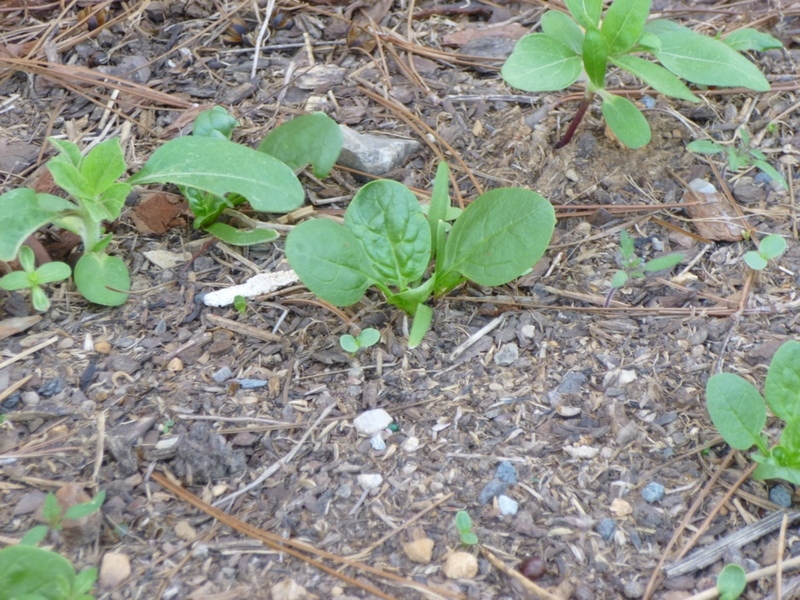 I'm fairly certain this is a spinach seedling. I planted Corvair this year from High Mowing Organic Seeds. 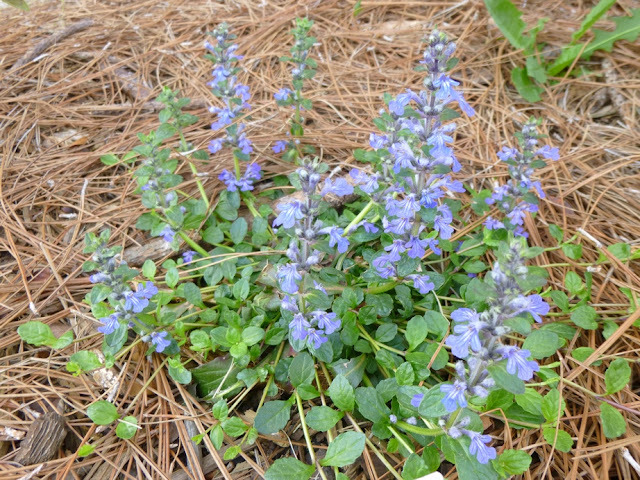 This is an ornamental sage - Salvia x sylvestris "Blue Hill". I planted it right next to Salvia x sylvestris "May Night. 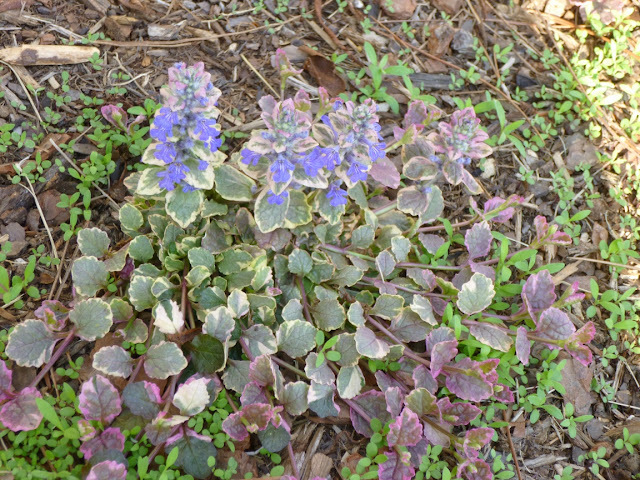 Both of them are growing well, but only Blue Hill has started flowering already. Both seem to be very low maintenance so far too. The old foliage looked tattered over the winter, but as with the Sweet Woodruff, I didn't do anything to it and the new foliage quickly emerged and took over this spring. This is new foliage emerging on the native Pachysandra procumbens. Hopefully it will get enough afternoon shade to do OK in this Eastern exposure spot. 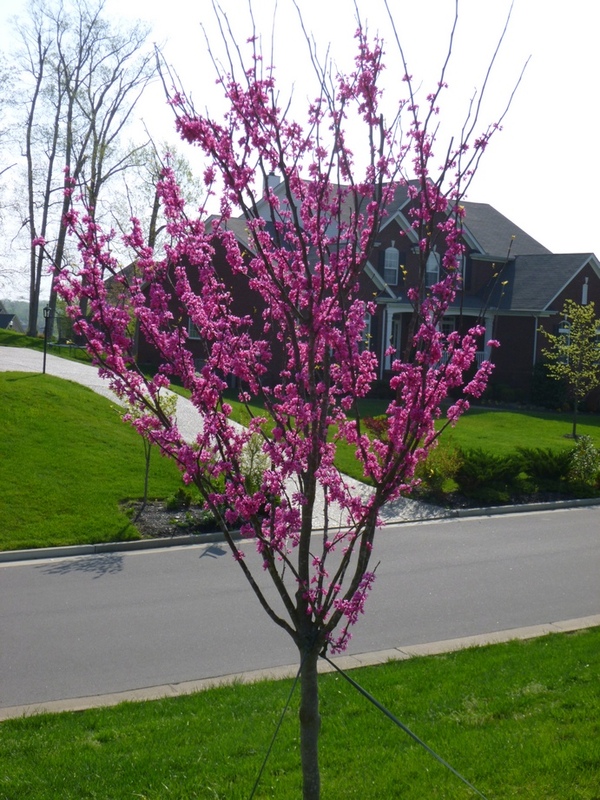 One of our new Appalachian Eastern Redbuds. 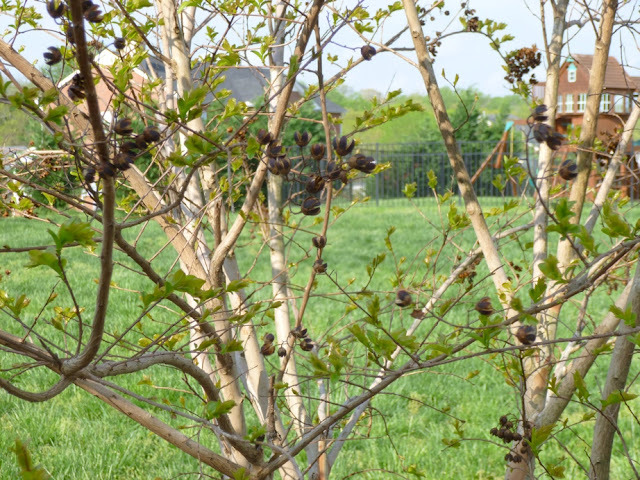 Not only are these beautiful trees, but they seem to do a great job of feeding the bees. 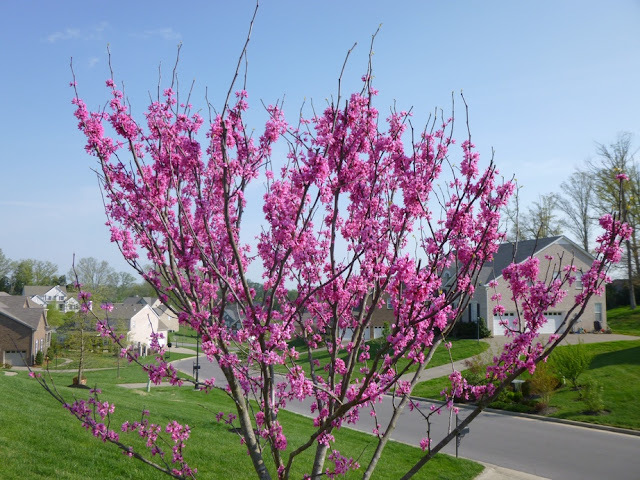 Another of the Appalachian Eastern Redbuds. We had four installed altogether. The leaves are just starting to emerge, which I'm guessing means that the bloom will probably be finished in about another week. The bloom season is not terribly long (maybe 2 weeks?) but the bright red buds add some color for 1-2 weeks before the flowers open. 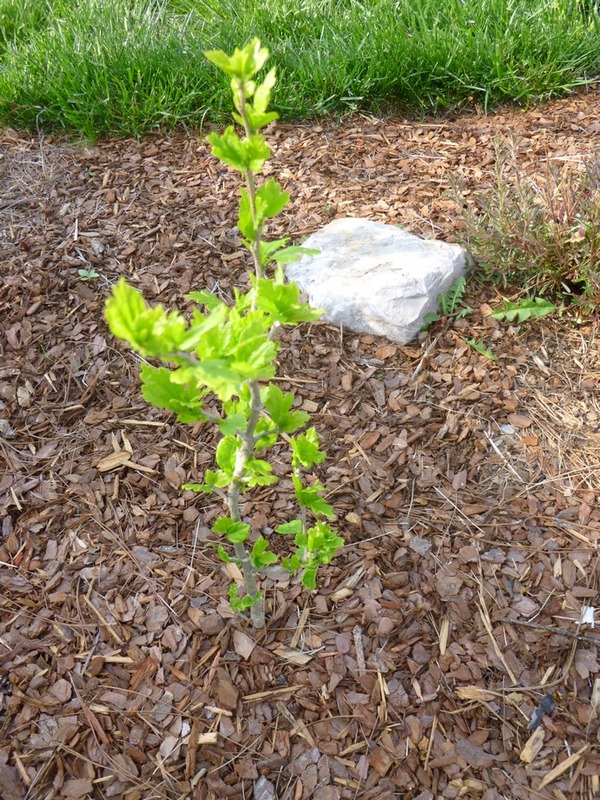 "Blue Bird" Rose of Sharon - purchased last autumn from Gardens in the Wood of Grassy Creek - is just starting to leaf out. Looks strong and healthy! 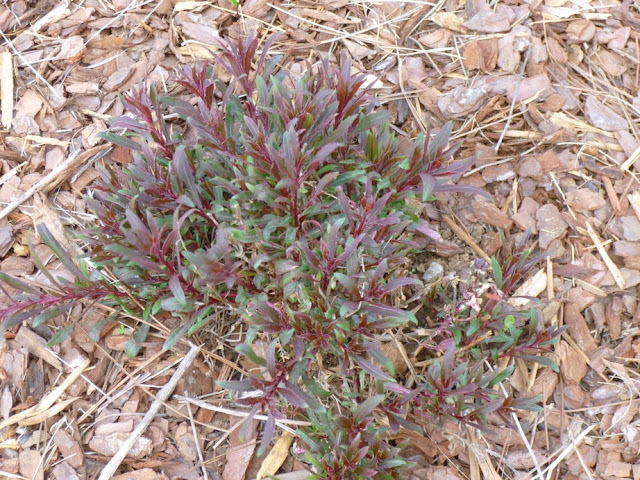 This plant is in full Western sun exposure. 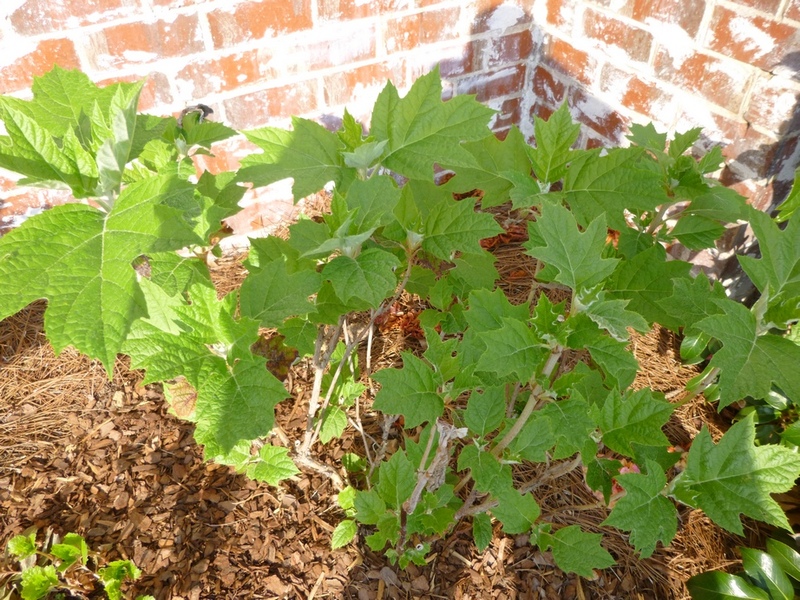 I'm absolutely agog over the beautiful foliage on this "Snowflake" Oakleaf Hydrangea! 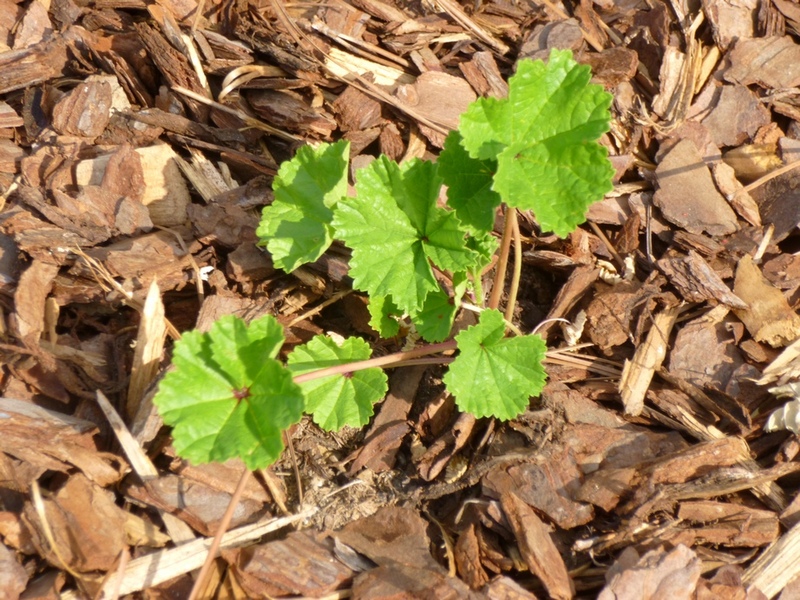 Malva "Zebrina" hasn't grown much since I planted it a couple of weeks ago, but it is hanging tough in a sunny and very windy spot. Here's one of the two native Coral Honeysuckles that I planted last year flanking the front porch steps. They have both really taken off this year. As you can see, this one is waving tendrils in all directions. I managed to curl a couple of them onto the railing, but I think I'll need to try to use some velcro ties to attach some more stems to the railing. Lots of buds and blooms on the plants this year, but I have not yet seen any hummingbirds or butterflies on the tubular flowers. Maybe the hummers only notice once the plant starts to climb more vertically? This is Helianthus "Lemon Queen" perennial sunflower. I just planted this maybe a week ago (or less) from Gardens in the Wood of Grassy Creek and it looks like it is really settling in nicely and sending up new growth. 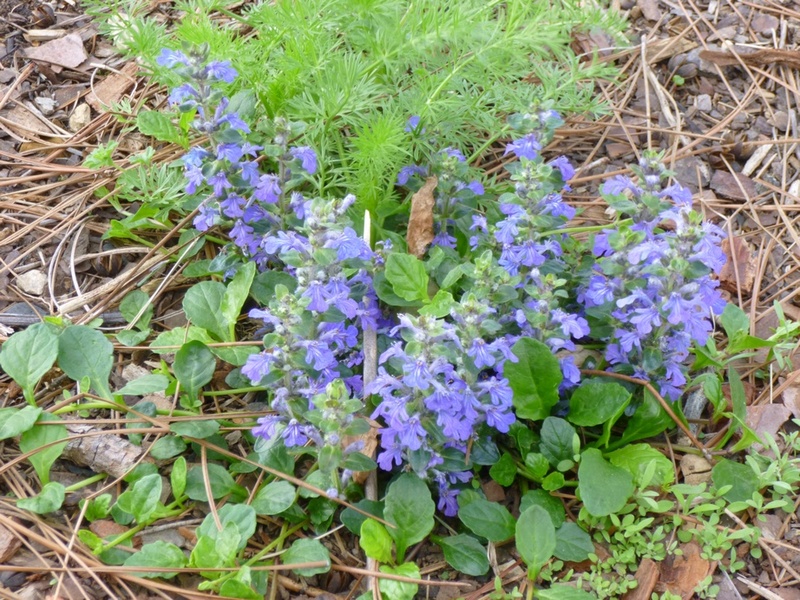 Hardy Blue Plumbago looked deader than a door nail as recently as 12 days ago. 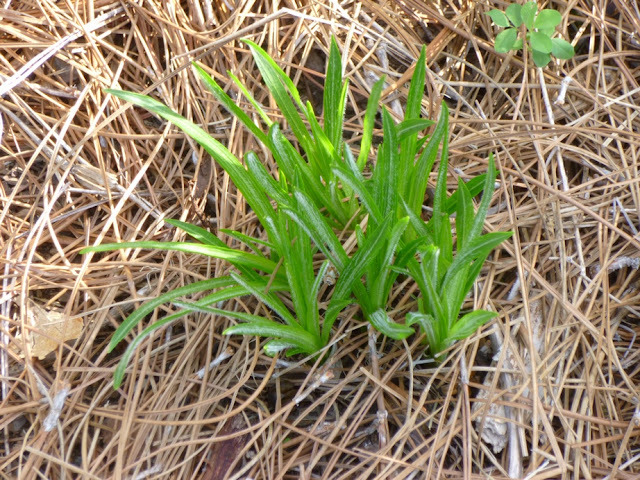 But now finally the new foliage is emerging. Guess I can cut back the old dead stems from last year. Or like with the Sweet Woodruff, I could leave them to see how long it will take them to decay and/or be obscured naturally. 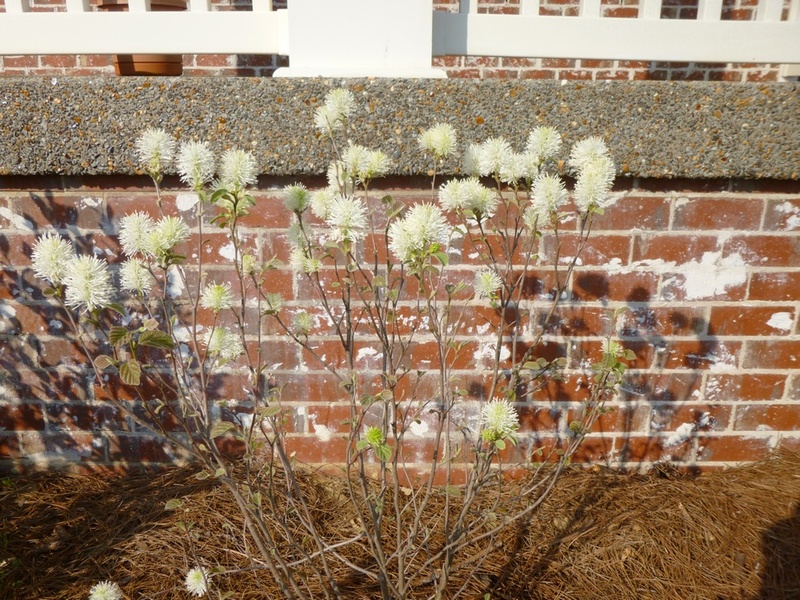 Fothergilla gardenii is full of blooms. It's definitely a pretty plant when in bloom, although I'm a little disappointed that I have not seen it attract more bees. Also, even though many websites describe Fothergilla as being very fragrant, I've only noticed a very faint sweet scent. Maybe Fothergillas need to settle in more and grow bigger before they start pumping out more fragrance? This is Arizona Apricot Gaillardia. Like the Malva (and the Vitex) it is in a very sunny spot. I think it is supposed to like full sun, so why does it seem so weak? I'm guessing it is not happy with the whipping it's getting from the wind. 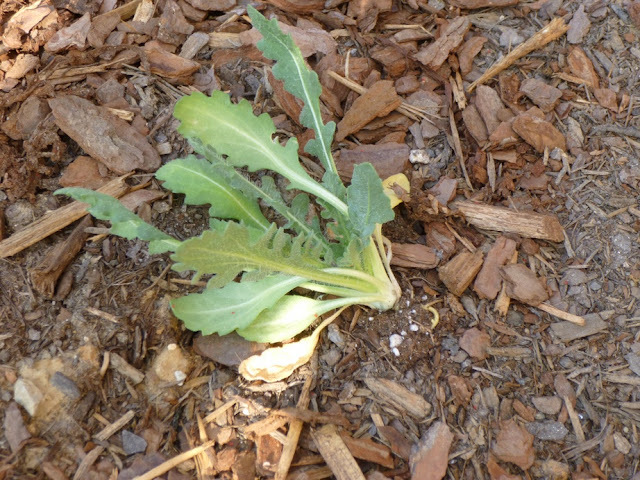 Hopefully it will recover, but this is one of the few plants I added this spring where I'd say the prospects do not look good. Here's a dwarf gaura that I added last spring. Can't remember the name. Maybe "Passionate Blush"? 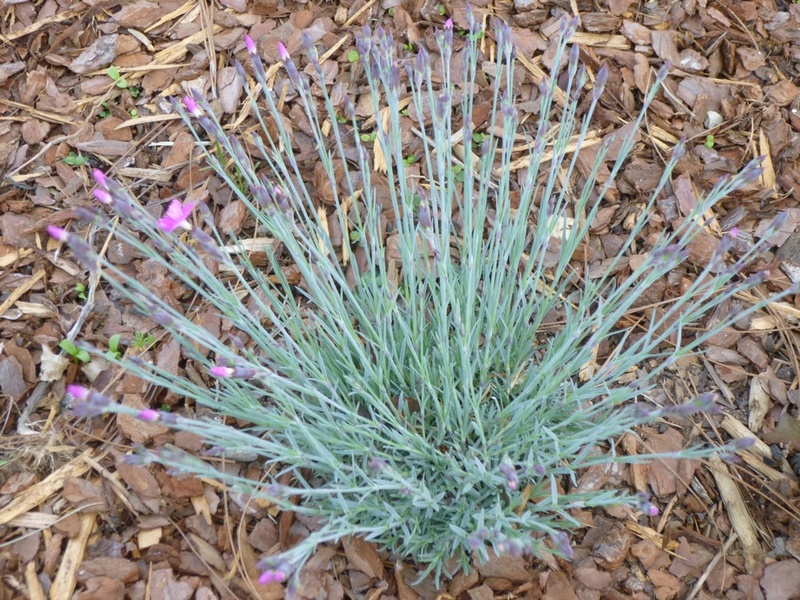 It barely bloomed or grew last year when it was completely overwhelmed and shadowed by a thick clump of 4-5 feet tall cosmos. I'm hoping to give it a little more space this year to do its own thing. I think it's already bigger and healthier looking this year than it ever was last year. Dianthus "Firewitch" has gotten even bushier than last time I posted about it two weeks ago. 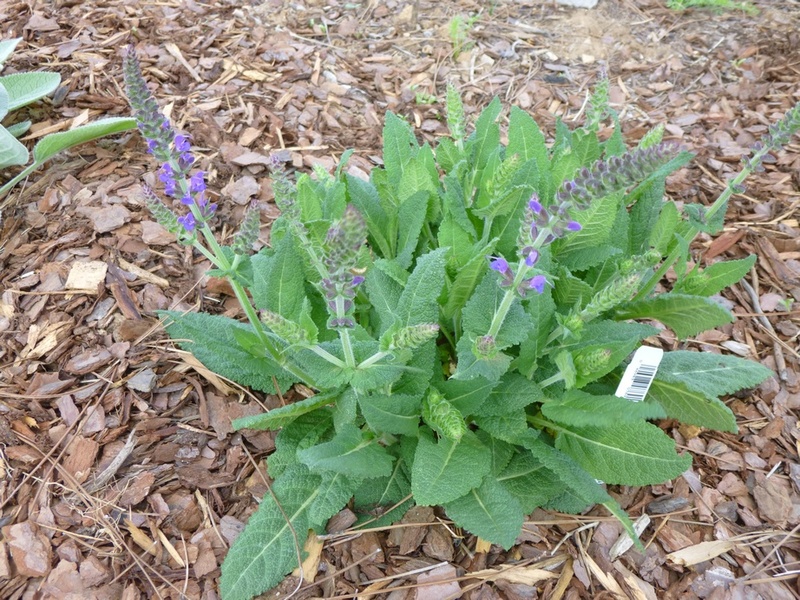 And now it is just starting to flower. I think it will put on a real show this year! This is Creeping Raspberry. It was tiny and looked mostly-dead when it arrived from Bluestone last year in one of those annoying coir pots. 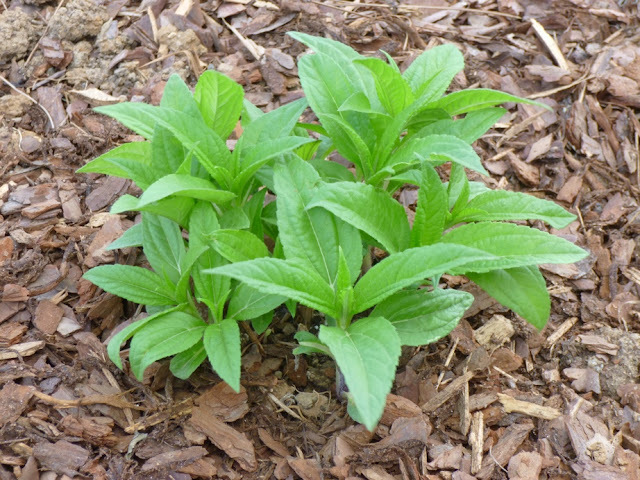 I really like the idea of the coir pots - less plastic is a good thing - but they just don't seem to decompose and thus I think they prevent the seedlings from growing as well as they otherwise would and/or contribute to root rot. 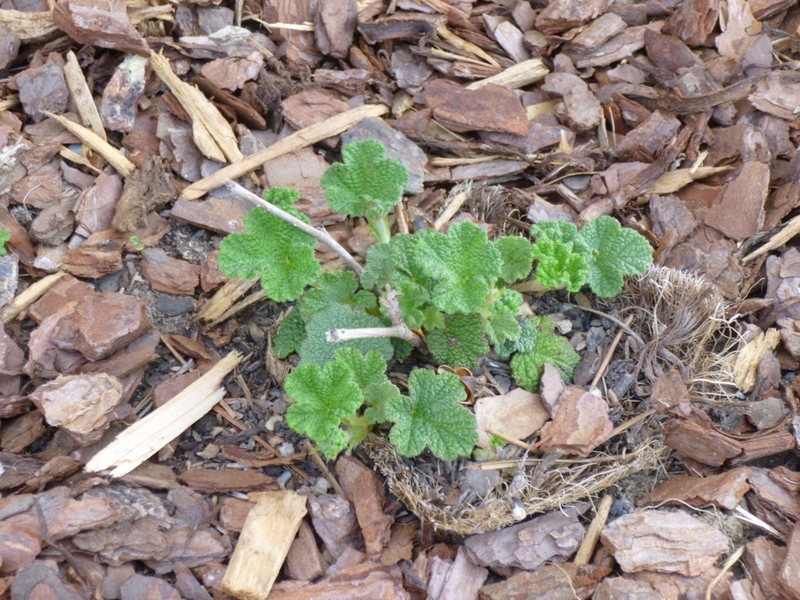 Nonetheless, Creeping Raspberry is supposed to be a pretty strong plant, so I'm figuring that if any plant roots can bust through that coir, this one can. (I also tried making some cuts and tears in the coir to give the roots a better chance at finding a way out.) Anyway, it's still very small, but it does seem to be growing and creating a nice dense little clump of leaves around its base. 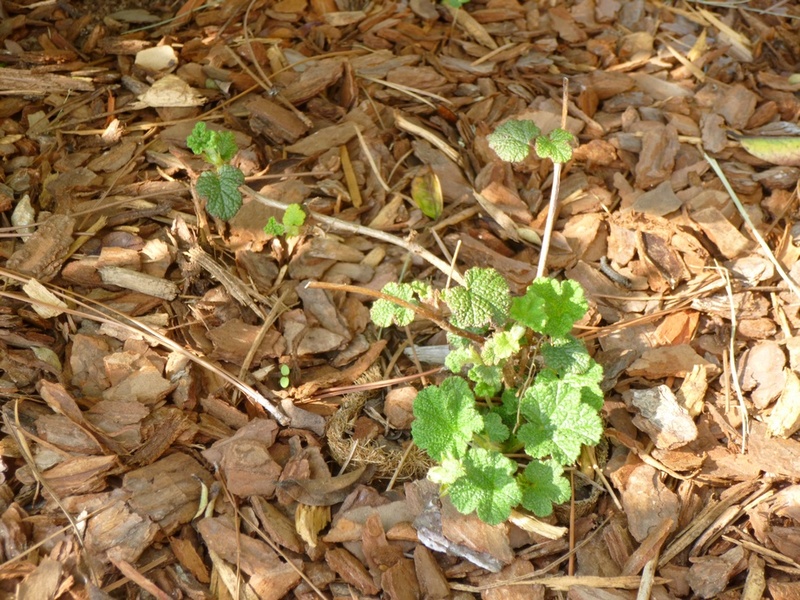 Here's one more Creeping Raspberry plant. I love the crinkled, textured and fuzzy foliage! 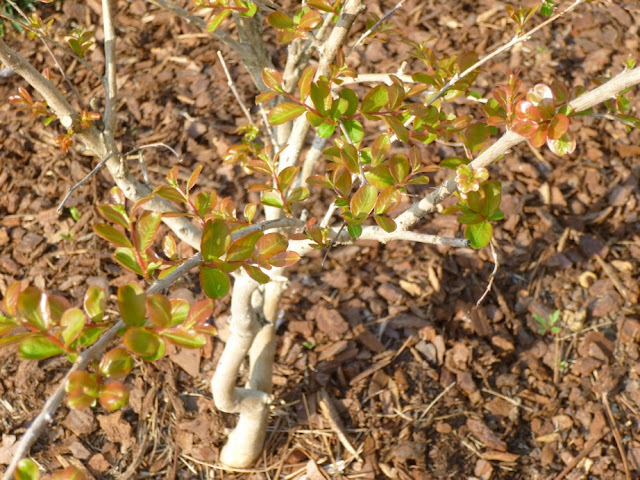 The Natchez crape myrtles are starting to leaf out. I can't wait for these to put on all their leaves and grow another 1-2 feet bigger this year. We have a number of them around our patio and they give a decent amount of privacy when they have their leaves. Not so much during their deciduous phase. 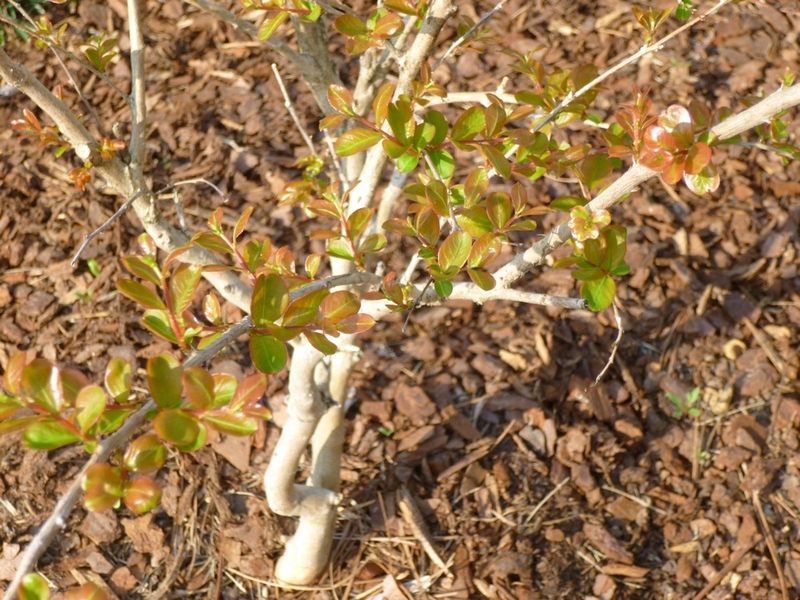 New foliage on another Crape Myrtle. I added this one last November. 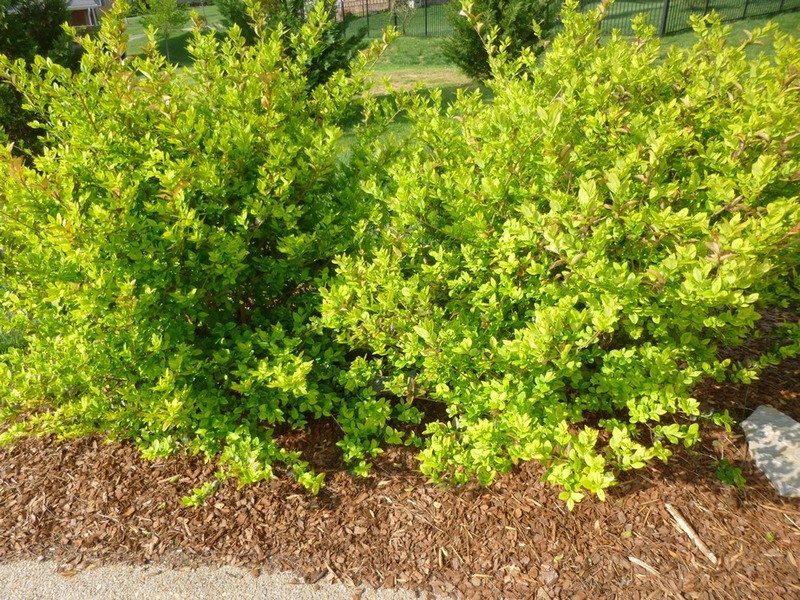 It's a dwarf white Crape called "Petite Snow" that is only supposed to get 5-feet high and 4-feet wide. 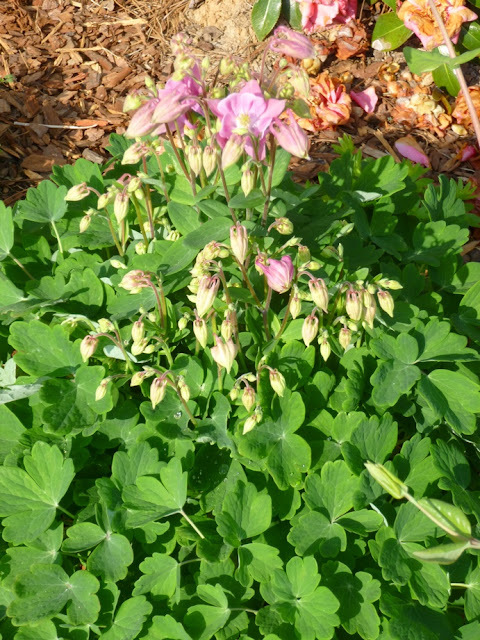 The Aquilegia "Winky Rose" is looking incredibly healthy and bushy. It's sent up dozens of buds and the first flowers have just started opening. Aquilegia is supposed to attract hummingbirds. Didn't see any last year on the plant, but with this many buds, maybe it will draw some hummers this year? I think this is a form of Euonymous, a.k.a. Burning Bush. But I've never seen the 'wings' that are supposed to be on Winged Burning Bush, so maybe it's a different variety? Not sure, because it was here when we moved in. Either way, Burning Bush is supposed to be invasive, and I wouldn't plant it, but I've ripped out so many other plants (hollies, boxwoods, other euonymous, the usual suspects) that I'm loathe to removing something else until I know exactly what I would want to put in its place. Still, I'll keep a close eye out for berries (haven't seen any in the previous two years) and if I do see some, I may remove the plant mid-season. 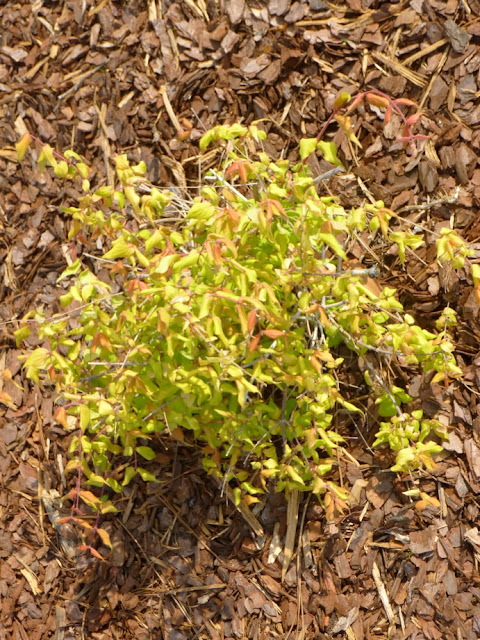 FYI, looks like a sterile Burning Bush has been developed in a lab and may someday give gardeners and landscapers a chance to have the benefits of Burning Bush without the invasiveness. This is the "Dream Catcher" version of Beauty Bush. Like the Malva, Gaillardia and Vitex, it's planted in a full sun, windy spot. I think I may have goofed when I sited this one last autumn. 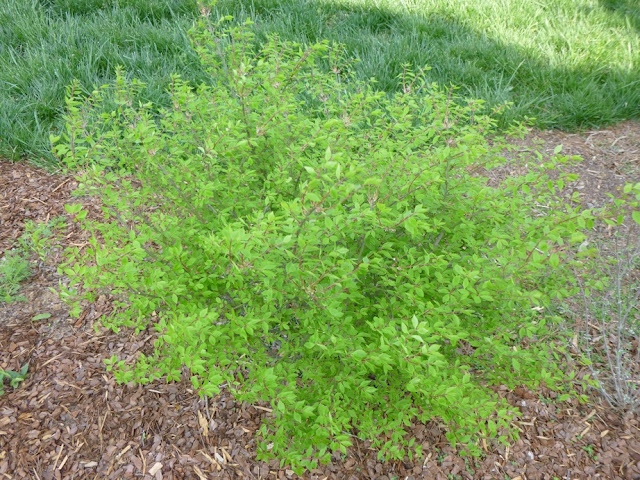 From further research, it seems that the species Beauty Bush (Kolkwitzia amabilis) is happy in full sun, but that (like many variegated plants) this "Dream Catcher" version may need partial shade. It doesn't look as though it's about to croak, but the leaves do look sort of twisted, as if they're trying to conserve moisture. 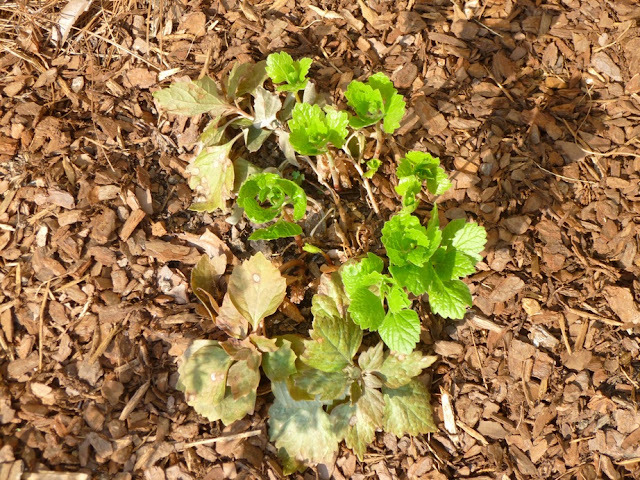 With a long stretch of cool weather forecast, I'm tempted to transplant "Dream Catcher" to a shadier spot. But the problem is that I'm not sure where to put it. I think I'll let it stay where it is for now. If it survives the summer, I'll probably be doing some landscaping in late autumn and can try to move it then. 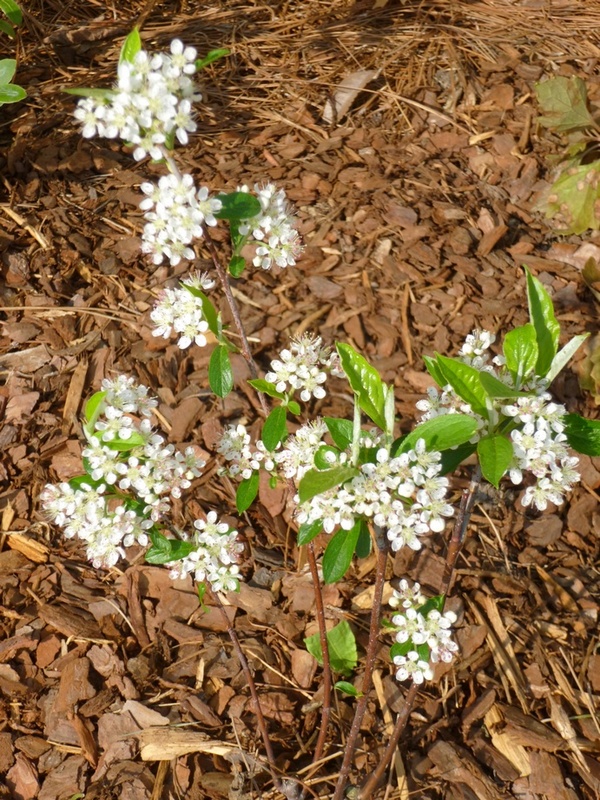 Finally, one of the happiest developments of 2013 so far has been the extent to which all three Aronia (Chokeberry) plants have leafed out, budded out and (in the case of the Aronia arbutifolia "Brilliantissima" shown here) already started flowering. For such a tiny tree, I'm astounded that it has decided to put out this many blooms. It's not exactly covered in pollinators, but I have seen it being worked by tiny bees. Or maybe they are tiny wasps or flies? Not sure. Either way, it's definitely drawing some pollinators in and will hopefully have a (tiny) crop of berries later in the year that I'm sure the birds will strip in about 2 seconds. In fact, I may strip the crop myself this year before it ripens, because I wouldn't want a big bird to damage the still-small plant trying to get the berries off. Interestingly, the other two Aronia, which are a different species (Aronia melanocarpa) have concentrated on putting out more foliage and fewer buds. They also have not yet started flowering. All three tree saplings are in Eastern exposure with morning sun and afternoon shade. I'm hoping that all three will put on some significant growth/height this year - they're all still quite petite - but regardless I'm thrilled with the way they made it through a tough first year last year after a spring planting and record summer heat. Very, very impressed so far with the toughness - and beauty - of the Aronias.